Has Smart Money Perfectly Timed Its JPMorgan Chase & Co. (JPM) Buying Spurt? Is JPMorgan Chase & Co. (NYSE:JPM) a good bet right now? We like to analyze hedge fund sentiment before doing days of in-depth research. We do so because hedge funds and other elite investors have numerous Ivy league graduates, expert network advisers, and supply chain tipsters working or consulting for them. There is not a shortage of news stories covering failed hedge fund investments and it is a fact that hedge funds’ picks don’t beat the market 100% of the time, but their consensus picks have historically done very well and have outperformed the market after adjusting for risk. After a few quarters of small declines in hedge fund ownership of JPMorgan Chase & Co. (NYSE:JPM), there was a rebound in Q3. 99 funds tracked by Insider Monkey were long the investment banking giant, owning over $11 billion worth of its shares. The increase pushed JPM into the top 10 among the 30 Most Popular Stocks Among Hedge Funds, though it couldn’t quite top all other banks in smart money popularity. Warren Buffett opened a $4.02 billion JPMorgan position in Q3. At the moment there are a large number of tools market participants put to use to appraise their stock investments. A couple of the most useful tools are hedge fund and insider trading activity. We have shown that, historically, those who follow the best picks of the top hedge fund managers can trounce the market by a significant margin (see the details here). What does the smart money think about JPMorgan Chase & Co. (NYSE:JPM)? At the end of the third quarter, a total of 99 of the hedge funds tracked by Insider Monkey held long positions in this stock, an increase of 8% from the second quarter of 2018. 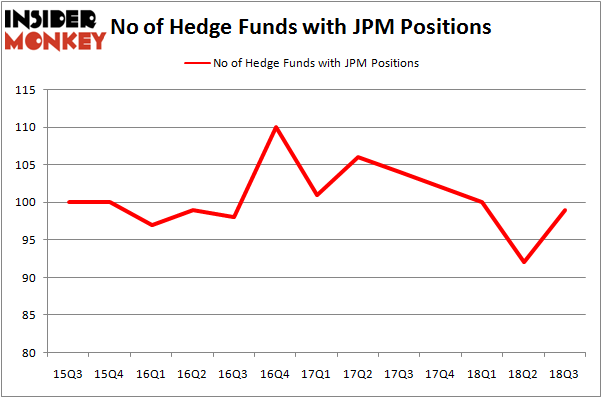 The graph below displays the number of hedge funds with bullish position in JPM over the last 13 quarters. With the smart money’s capital changing hands, there exists an “upper tier” of noteworthy hedge fund managers who were adding to their stakes meaningfully (or already accumulated large positions). According to publicly available hedge fund and institutional investor holdings data compiled by Insider Monkey, Berkshire Hathaway, managed by Warren Buffett, holds the number one position in JPMorgan Chase & Co. (NYSE:JPM). 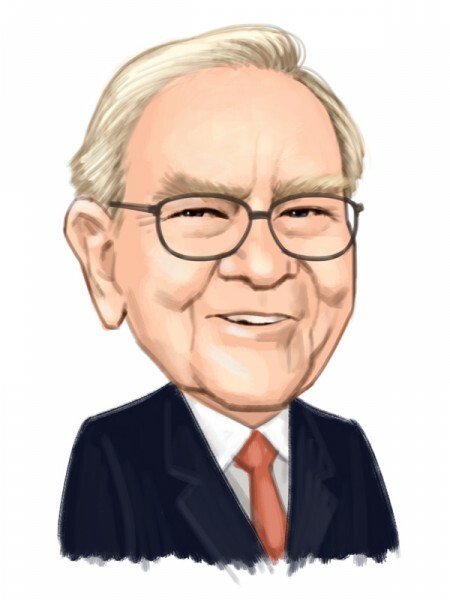 Berkshire Hathaway has a $4.02 billion position in the stock, comprising 1.8% of its 13F portfolio. The second largest stake is held by Lansdowne Partners, managed by Alex Snow, which holds a $904 million position; 9.5% of its 13F portfolio is allocated to the stock. Other hedge funds and institutional investors that are bullish comprise Boykin Curry’s Eagle Capital Management, Cliff Asness’ AQR Capital Management and Ken Fisher’s Fisher Asset Management. Now, specific money managers have jumped into JPMorgan Chase & Co. (NYSE:JPM) headfirst. Berkshire Hathaway initiated the largest position in JPMorgan Chase & Co. (NYSE:JPM). Jim Simons’ Renaissance Technologies also initiated a $231.9 million position during the quarter. The other funds with new positions in the stock are Daniel S. Och’s OZ Management, Julian Robertson’s Tiger Management, and Noam Gottesman’s GLG Partners. Let’s also examine hedge fund activity in other stocks similar to JPMorgan Chase & Co. (NYSE:JPM). These stocks are Johnson & Johnson (NYSE:JNJ), Exxon Mobil Corporation (NYSE:XOM), Visa Inc. (NYSE:V), and Royal Dutch Shell plc (NYSE:RDS). This group of stocks’ market values are closest to JPM’s market value. As you can see these stocks had an average of 66 hedge funds with bullish positions and the average amount invested in these stocks was $6.01 billion. That figure was $11.44 billion in JPM’s case. Visa Inc. (NYSE:V) is the most popular stock in this table. On the other hand Royal Dutch Shell plc (NYSE:RDS) is the least popular one with only 36 bullish hedge fund positions. JPMorgan Chase & Co. (NYSE:JPM) is not the most popular stock in this group but hedge fund interest is still above average. Considering that hedge funds are fond of this stock in relation to its market cap peers, it may be a good idea to analyze it in detail and potentially include it in your portfolio. Is It Time to Follow Hedge Funds Into BP p.l.c. (BP)? Hedge Funds Are Underwhelmed by Sanofi (SNY)’s Growth Prospects Is Old Dominion Freight Line, Inc. (NASDAQ:ODFL) A Good Stock To Buy? Billionaire Ken Fisher is Betting Big on this Japanese Banking Giant Hedge Funds Are Dumping C.H. Robinson Worldwide, Inc. (NASDAQ:CHRW) Is Ulta Beauty, Inc. (NASDAQ:ULTA) A Good Stock To Buy?